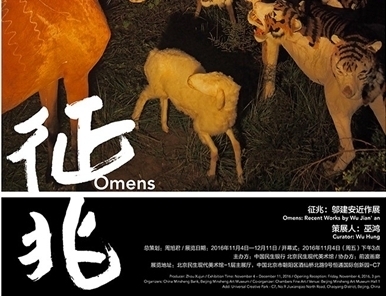 Beijing Minsheng Art Museum presents: Omens: Recent Works by Wu Jian’an from November 4 to December 11, 2016. Curated by Wu Hung, this is the first comprehensive solo museum exhibition of the artist’s work, and is co-sponsored by China Minsheng Bank and Minsheng Art Museum, and assisted by Chambers Fine Art. Wu Jian’an was born in 1980 in Beijing, graduated with MFA from Central Academy of Fine Arts in 2005 and became a lecturer at CAFA. Currently he is the Associate Professor and graduate student supervisor in the Department of Experimental Art at CAFA. His work has been exhibited at numerous institutions including the Fukuoka Asian Art Museum, Museum of Lincolnshire Life, China Central Academy of Fine Arts, John F. Kennedy Center for the Performing Arts, Prince Gong’s Mansion, Museum of Fine Arts, Boston, and The Metropolitan Museum of Art in New York. Interpreted in this way, this exhibition establishes a unique link between contemporary thinking and the mythical world. Each of the four themes presented here are rooted in ancient Chinese legends: the headless giant Xingtian who fought against the Supreme Divinity, grotesque animals that make strange sounds from the Classic of Mountains and Seas, the catastrophic ending of the boy assassin Mei Jianchi, and the Money Trees of the Han dynasty that have inspired Wu Jian’an’s Daydream Forest. Like cultural genes, these stories and characters have been passed down through history and reborn in Wu’s art.